The little Kentenich University works through a correspondence course. The course participants meet for a day four times a year in the Schoenstatt Centre at Óbudavár, and receive new incentives and enthusiasm for their future work. 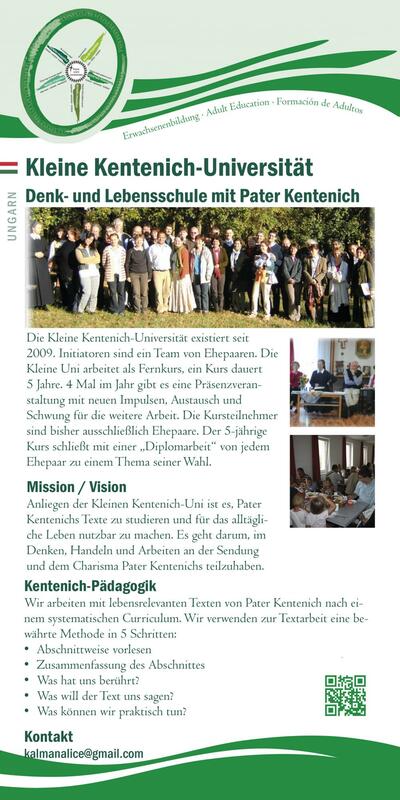 With the foundation of the Little Kentenich University they express their longing and petition to take deeper root in Schoenstatt. They want their thinking, actions and work to share in Fr Kentenich‘s mission and charism. The couple read out the Kentenich text paragraph by paragraph. The couple summarise what has been read in their own words.